An emergency backpack sits in I-4. 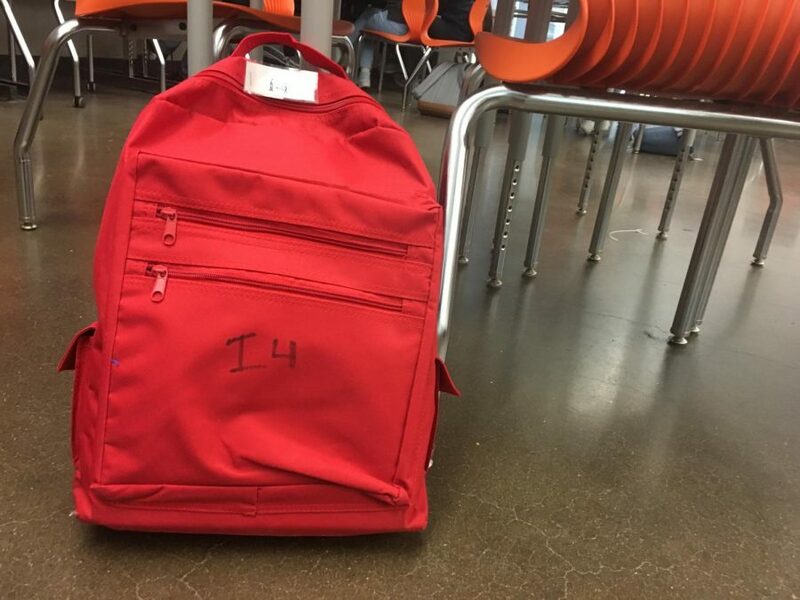 In case of an emergency, the backpack carries supplies for the class. On Thursday, April 5th, Woodside High School will have a lockdown/barricade safety drill, in light of the recent shootings. During fourth period, the entire school will participate in the drill, in accordance with the San Mateo County sheriff office. Thursday will have a Wildcat schedule for the day. “I think it’s important to be prepared in any circumstances, so as a school we have to make sure that because we’re such a large school, we’re prepared across the board,” Francisco Negri, the head of counseling said. As the threat of violence at school increases, students fear for their safety in school. Some parents are also concerned to send their students to school because they fear for their child’s lives. “I think part of having drills like this is to ease people’s minds knowing that it’s being thought of and were taking all measure to make students feel comfortable in school, addressing any concerns they may have. Also, i think knowing that we have accounted for all the possibilities and to make sure that were better prepared. If anything these things enlighten us on what more has to be done,” Francisco Negri said. Although having drills is necessary in preventing any harm to students, most people are more concerned with fixing the root of the problem itself. The ongoing violence has allowed for many people to express their opinions on guns. Erin Kilty, the Foods teacher at Woodside High School said, “[The drill] is relevant, and its important that parents and students feel that the school is prepared if something were to happen, although it is very unlikely”. Teachers believe that it’s important to spend time preparing for such an important situation. “I think it’s important the school district invest time and effort in stopping violence from happening all together,” Erin Kilty said.